I have a tendency to search out the exotic ideas in cooking. I love trying new ingredients or creating unexpected ingredient pairings. But I also understand that the simple things in life can be the most deeply satisfying. Take this salad for instance. For most, I’d hardly call quinoa an exotic ingredient anymore. And corn and black beans are a classic coupling. Put them all together, and you have an easy, tasty side with a minimum of culinary effort. I’m sure many of you out there will be barbecuing and picnicking with friends this upcoming Labor Day weekend. I highly recommend this dish as your contribution to the collective meal. I guarantee it will be a hit. Put simply, it’s a feel good summer dish that won’t keep you slaving in the kitchen when what you’d rather be doing is sticking your toes in the sand while the waves take you to your happy place. 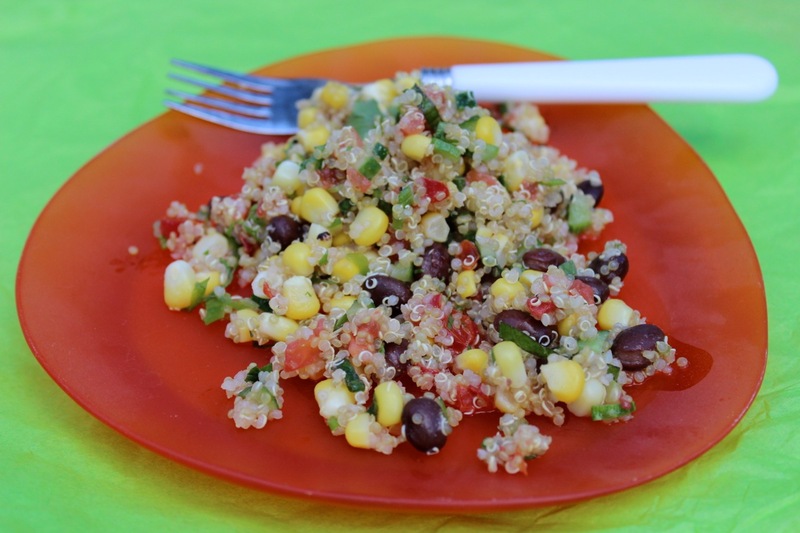 In a large bowl, combine the quinoa, corn, beans, tomato, cucumber, and scallion and stir to combine. In a small measuring jug, whisk together the lime juice, cumin, and oil. Pour the dressing over the salad and stir in the cilantro and mint. Season to taste with salt and pepper and serve. This entry was posted in lunch, side and tagged black bean, corn, cumin dressing, quinoa, salad. Bookmark the permalink.